SYRACUSE, N.Y. – Cortland took a 7-0 lead after three and a half innings and held on to defeat St. Joseph's College (Long Island), 9-7, in an elimination game of the NCAA Division III Baseball New York Regional. The game was moved from Auburn to Onondaga Community College due to the weather forecast. Cortland (34-11) will face Baldwin Wallace in another elimination game Sunday at noon at Auburn's Falcon Park. The game was originally scheduled for a late Saturday start before being moved. The winner of the Cortland/Baldwin Wallace game will play Sunday at 3:30 p.m. against either Southern Maine or Swarthmore. A potential championship round game would be played Sunday at 7:30 p.m. if the game features Southern Maine and Swarthmore. If either Cortland or Baldwin Wallace win twice Sunday, the championship round would start on Monday. 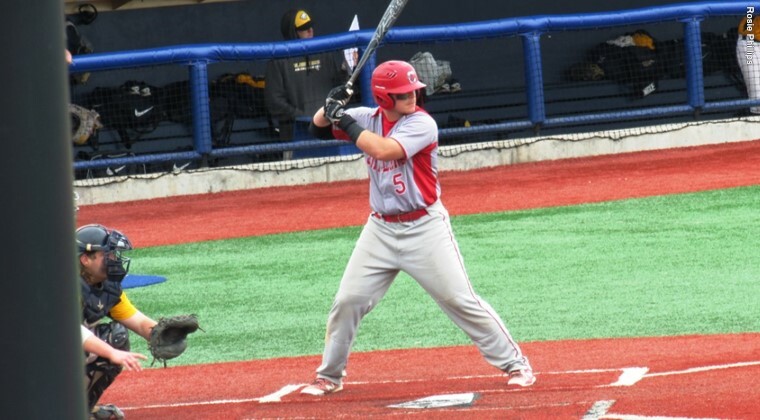 Patrick Schetter (Beacon) and Marcos Perivolaris (Mattituck) each homered for Cortland in its wins over the Golden Eagles, who finished the season 27-18. Schetter was 2-for-5 with three RBI and Perivolaris was 2-for-4 with two RBI. Matthew Personius (Binghamton/Chenango Valley) ended 3-for-4 with a walk and Colin BeVard (Syracuse/West Genesee) was 2-for-5 with a triple, RBI and two runs. Paul Britt led St. Joseph's by going 4-for-5 with a homer, triple and four runs scored. Daniel Campanelli and Tyler Sanderson each finished 2-for-4, with Campanelli driving in two runs. Kyle Naugle (Fayetteville/Jamesville-DeWitt) earned the win in relief of starter Jake Casey (Homer). Casey allowed four runs on six hits with three strikeouts and two walks. He left with the lead, but didn't pitch the five innings necessary for the victory. Naugle went three and two thirds innings and gave up three runs on five hits with one walk and one strikeout. Jarrod Bellinger (Watertown) entered after Britt led off the bottom of the ninth with a solo homer and retired all three batters he faced on a strikeout and two fly outs for his first save of the season. St. Joe's starter PJ Martino took the loss with four hits and three runs allowed in two innings. He fanned three batters. Nick Mannarino, the Golden Eagles' third reliever, went the final five innings and gave up two hits, two walks and two runs with three strikeouts. Cortland scored a run in the first on a one-out Antonio Pragana (Hopewell Junction/John Jay) double and a Schetter RBI single. The Red Dragons scored twice in the second on BeVard's RBI triple and Pragana's sac fly, and the lead grew to 7-0 in the fourth on a Jack Massa (Shoreham/Shoreham-Wading River) RBi double just inside the third base bag, a throwing error after BeVard's steal of third, and Schetter's two-run homer to left. St. Joseph's got on the board with three in the bottom of the fourth on Anthony Raucci's sac fly and Daniel Campanelli's two-run infield single. Campanelli hit a ball up the middle with runners on second and third and two outs. The ball was stopped by the second baseman behind the bag, but Campanelli beat the throw, and the runner from second, Tyler Sanderson, never stopped running and scored on the play. Three straight singles by Britt, Dylan Piscitelli and Sanderson loaded the bases with one out in the fifth, and with two outs Matthew Burnett walked to force in a run. A fielder's choice kept the damage at one run. Perivolaris provided what proved to be two crucial runs with a two-run homer to left center in the sixth following a Personius walk. The Golden Eagles got those two runs back in the seventh. Britt led off with a triple and scored on a Piscitelli sac fly, and later in the inning Burnett hit a two-out RBI double to left center. Campanelli then hit a liner to center that looked like it might drop in for an run-scoring single, but Pragana raced in and made a diving catch to end the inning and keep the Cortland lead at 9-6.